Residents across all of our villages are celebrating Queen Elizabeth’s 90th birthday today with a string of organised events up and down the country. At our picturesque Lime Tree Village in Warwickshire, these began bright and early, when the Rugby town crier dropped by at 8:30am to wish Her Majesty a happy day. 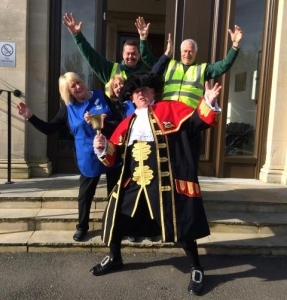 Pictured with the town crier is domestic supervisor Theresa Childs, her deputy Pauline Box, assistant maintenance supervisor George True and grounds assistant, Chris Cheesman. Unusual gifts Her Majesty has received over the years include two black beavers from Canada, as well as jaguars and sloths from Brazil.